The excitement is palpable across our 9.99 million-kilometres-squared country. It’s Canada’s 150th birthday, and there is no better way to celebrate north of the 49th parallel than partaking in one of the many events, exhibits, or various other means of honouring the country notorious for hockey, Tim Horton’s and maple syrup. Learn a new musical instrument. 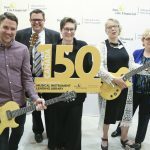 Councillor Evan Woolley and Grammy and Juno Award-winning artist k.d lang help to kick-off the Sun Life Financial Musical Instrument Lending Library program in Calgary with Paul McIntrye Royston, Janet Hutchinson and Jennifer M McIntosh. Photo courtesy of Sunlife Financial. Have you ever felt that the only roadblock in your way of becoming the next Jimi Hendrix, Paul McCartney, or Joan Jett was access to a musical instrument? Well, no longer let the commitment of purchasing an instrument stand in your way. 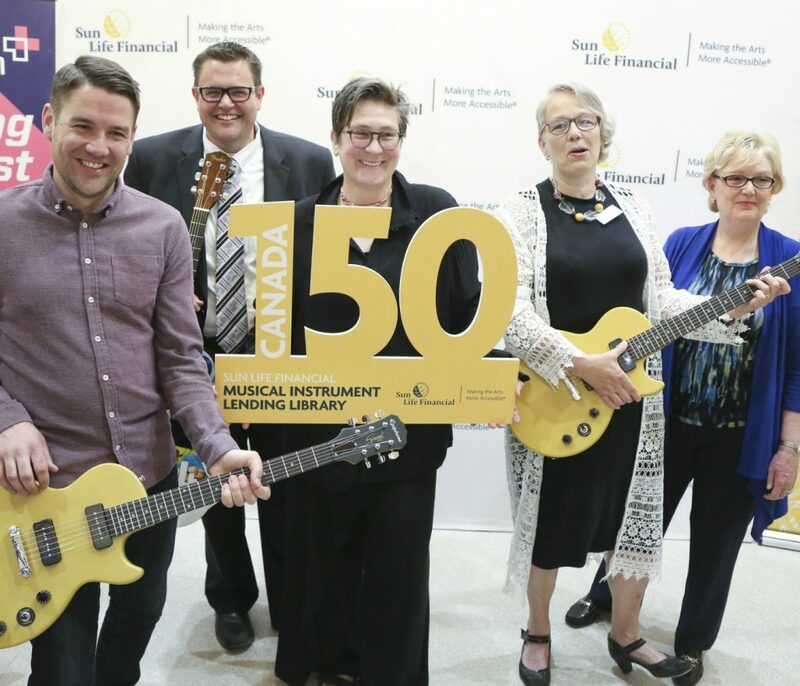 Thanks to a $140,000 donation from Sun Life Financial, 150 musical instruments — for 150 years of Canada — are now available at the Memorial Park Library, ranging from guitars and ukuleles to xylophones and drums. Grab a brewski — but not just any brewski. Calgary’s own Last Best Brewing & Distilling is one of 12 brewing companies that joined forces in the name of Canada’s sesquicentennial to produce the Red Racer Across the Nation Collaboration. Each distinct beer in the pack is inspired by the province or territory it hails from. Alberta’s bevvy, a Berry Light Berliner Weisse, is a wheat-based beer using ingredients from the plains, as well as raspberries and vanilla to create a fruity, slightly sour beer perfect for patio season. Take part in official Canada Day celebrations. Calgary’s Canada Day schedule is stacked. Ring in the country’s 150th by heading down to Chinatown, from 10 am to 6 pm, to watch Asian cultural dances, martial arts displays or build a kite. A short stroll east will take you to Riverfront Avenue, where various musical performances by the likes of Tegan and Sara and Tegan and Sara and Michael Bernard Fitzgerald will take place from 10 am to 11:30 pm Receive a lesson in turban tying by visiting the Peace Bridge from 10 am to 6 pm, and take part in a multicultural fair at Eau Claire from 11 am to 9 pm Be sure to party at The King Eddy — where you can also try your hand at a karaoke pedicab and pay your fare with musical talent (or lack thereof). And finally, don’t miss the sure-to-be-exemplary Canada Day fireworks. Get a music history lesson. Gearheads, nostalgia junkies and music history buffs rejoice: the National Music Centre has compiled 150 items spanning more than 450 years of music history, which is available for viewing on their online database. Feast your eyes on finds from an 1880 Bacigalupo Barrel Organ to a 20th-century k.d. lang stage outfit. Stretch your vocal chords and strum your strings. For the musically inclined, participating in a city-wide flash concert doesn’t sound like a bad way to honour Canada’s birthday, does it? Sign up with Arts Commons to sing-a-long — or strum-a-long with your ukulele, banjo or guitar — alongside Ian Tyson, as you and your kindred spirits perform “Four Strong Winds” in honour of the true north, strong and free. While grabbing a tea may be reminiscent of long Starbucks lines and high school students asking if you would like one bag or two, drinking tea has been an integral part of the Chinese culture for thousands of years. Mark Canada’s sesquicentennial while observing Chinese tea drinking rituals and learning about herbal medicine traditions at the Calgary Chinese Cultural Centre. Yes, you read that right. W.P. Puppet Theatre is putting together a video celebrating Canada’s new avian emblem, the gray jay, with the help of 150 (or more) national and international puppet makers of all skill levels — including newbies. Gather your closest friends, and check out W.P. Puppet Theatre online to sign up for a free puppet making class and to take part in the video. Visit Contemporary Calgary’s Utopia Factory. 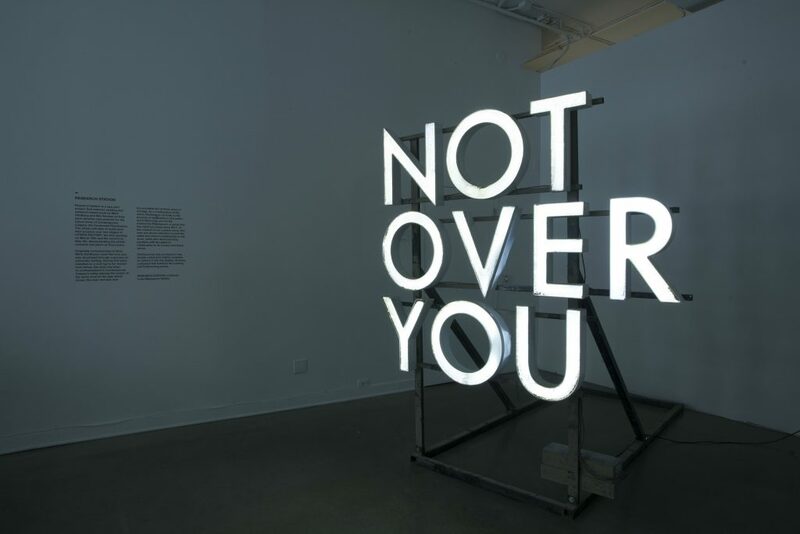 Mark Clintberg, Not Over You, 2014-2015. Photo by Jeremy Pavka, courtesy of Contemporary Calgary. Commemorating Canada’s B-Day, this research and exhibition project looks at the conceptualisation of communities and their historic landmarks, while investigating issues such as nationalism, state making, inclusion and belonging. The show takes place in three parts, When Form Becomes Attitude, curated by Noa Bronstein, Research Station, curated by Lisa Baldissera and Nate McLeod and Architecture and National Identity: The Centennial Projects 50 Years On, curated by Marco Polo and Colin Ripley. Stop and smell the roses while visiting Central Memorial Park, the Dorothy Harvie Gardens, or Reader Rock Garden — all of which have received the Canada 150 Garden Experience designation by the Canadian Garden Council in collaboration with the Canadian Nursery Landscape Association. Take a slightly more adventurous stroll. Join Fit Frog Adventures owner and author of Calgary’s Best Walks, Lori Beattie, on a guided, multilingual walking tour through Calgary. Tour’s vary by date, with the next YYC walkabout exploring the Memorial Park Library area — mosey from the Beltline through the Elbow River Pathway, to Roxboro Natural Park, Stanley Park, and wind up in Mission. Languages spoken will be English, French and Tigrinya. The tours fill up fast, so be sure to register ahead of time. When: June 27, 7:30 p.m.
Where: 1221 2 St. S.W. Make a date with a bard. All the world’s a stage, or at least, Canada is on the world’s stage with our country’s 150 birthday bash. Why not create a little stage time of your own this Canada Day and celebrate by watching As You Like It, performed by Shakespeare by the Bow? Pack a picnic and lose yourself in the rhythmic iambic pentameter of Will’s words while taking a break for the day’s surrounding hubbub. Have a haunted — ahem — happy Canada 150. Start Canada Day off with a walk down memory lane — the memory’s of Canadians past that is. Take part in a tour that will guide you through Canada’s oldest graveyard, Union Cemetery. Spot names significant to Calgary’s history such as James Macleod, the RCMP Colonel who named Calgary; John Ware, the legendary cowboy and former slave; newspaper editor Robert Edwards; and Sir James Lougheed. Celebrate Canadian talent at Otafest. Tap into your inner Sailor Moon, Ash Ketchum or Naruto Uzumaki and meet eight talented Canadians who have made their mark in the world of anime at this year’s Otafest — including the original voice of Sailor Moon herself: Tracey Moore. Also, making an appearance is the voice of Sailor Moon’s kitty sidekick Luna: Jill Frappier. RedBall Project photos courtesy of Brit Worgan. 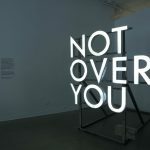 This travelling public art piece is not to be missed. 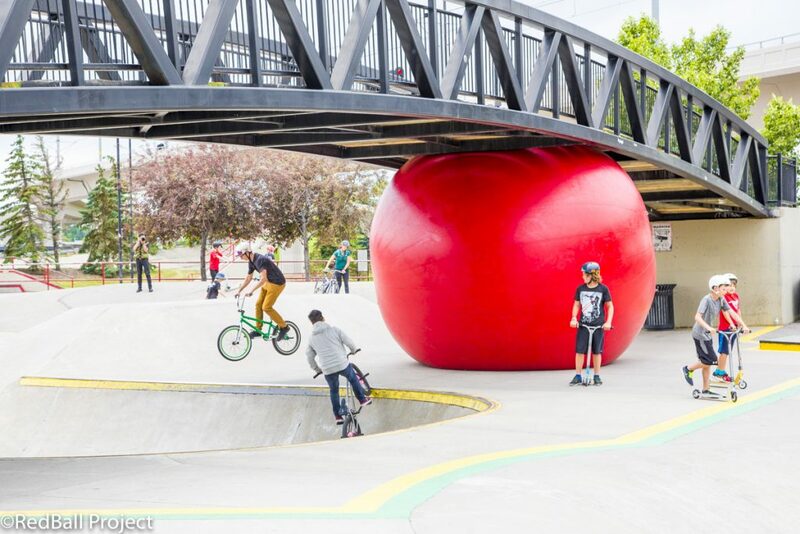 Created by American artist Kurt Perschke, the ball has traveled to roughly 27 different cities — from Antwerp to Taipei. 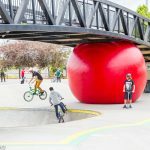 In Perschke’s artist statement, he says the RedBall is meant to instill excitement, playfulness and provoke imagination in passers-by. 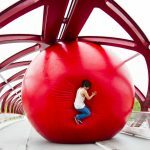 Considered the longest-running street artwork, the ball is making its way to Calgary just in time for Canada Day. Some of the Midway-inspired plates offered up at The Palace Theatre on Canada Day. If you literally cannot wait for the taste of Midway food — mmm, deep-fried everything! 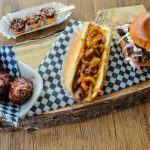 — then head down to Stephen Avenue, where the folks at The Palace Theatre will be cooking up Stampede-inspired treats all day long. Executive check Trevor Atamanchik created several grab-and-go dishes for the day, including Cowboy Nachos, $7, which is served up in a bag of Cool Ranch Doritos and topped with guacamole, salsa and pulled pork. 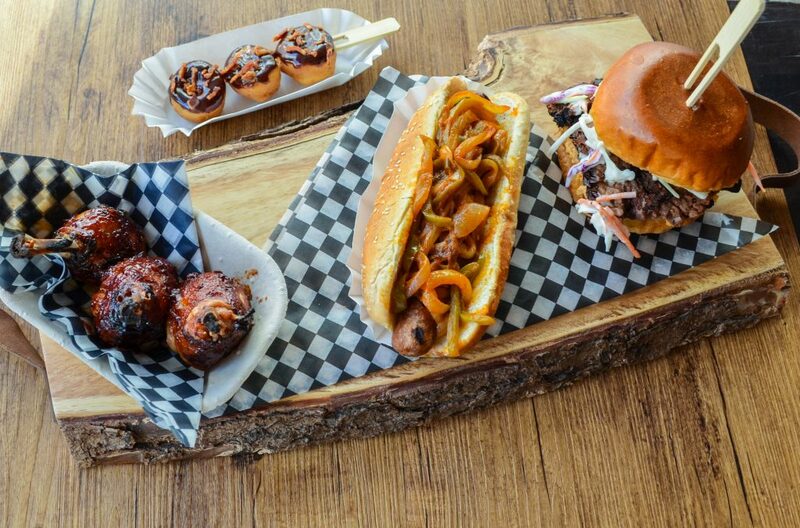 But it doesn’t stop there, there are several other bites offered up, including Glazed Bacon Mini Donuts, Whisky BBQ Chicken Pops and classic Pulled Pork on a Bun.